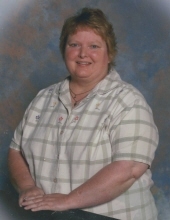 Sheryl L. Allen, 60 of Claremore, Oklahoma passed away Saturday, April 6, 2019 at Claremore Nursing Home with family at her side. Sheryl Lynn Allen was born July 24, 1958 at Independence, Kansas the daughter of Henry Allen and Elizabeth (Bennett) Allen. She graduated from Lenapah High School in 1978. She enjoyed hiking, walking and loved horses. She will be remembered for her love for her family and her ornery whit. She was known to pick on people she knew and loved. She lived in Coffeyville until she moved to Claremore in 2015. Sheryl was a member of the Lenapah First Baptist Church. She is survived by her children, Rebecca Wickham of Verdigris, Oklahoma, Baranda Cole of Joplin, Missouri, siblings, Phil Allen of Edna, Kansas, Connie Smith of Parsons, Kansas, Mike Allen of Chanute, Kansas, Cindy Kimrey of Lenapah, Oklahoma, 4 grandchildren, Courtney Wickham, Matthew Boyle, Isabelle Wickham and Noah Campbell. She was preceded in death by her parents, sister, Debbie Allen and step father, Junior King. Celebration of Life Funeral Services will be held 10:30 A.M., Friday, April 12, 2019 at the Lenapah First Baptist Church in Lenapah, Oklahoma. The family will receive friends from 6:00 P.M. until 7:30 P.M. Thursday, April 11, 2019 at Wickham Family Funeral Home, 216 East 4th, Cherryvale, Kansas. Interment will be held at 2:00 P.M., Friday, April 12, 2019 at Mount Hope Cemetery, Independence, Kansas. Memorial remembrances are suggested to the Sheryl L. Allen Memorial Fund in care of Wickham Family Funeral Home. To send flowers or a remembrance gift to the family of Sheryl L. Allen, please visit our Tribute Store. "Email Address" would like to share the life celebration of Sheryl L. Allen. Click on the "link" to go to share a favorite memory or leave a condolence message for the family.